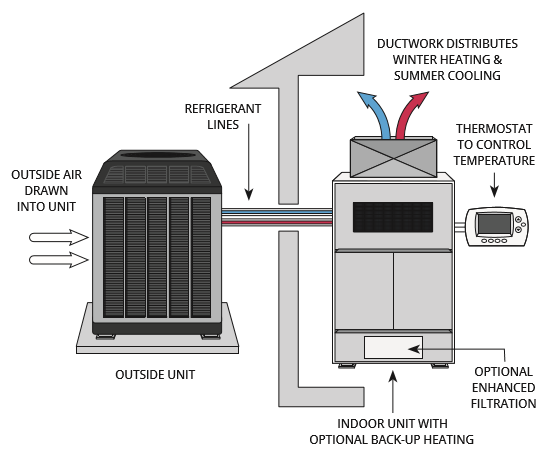 What are central heat pumps? Space heating is the largest use of energy in homes and a significant contributor to greenhouse gas emissions. An ENERGY STAR® certified heat pump is a highly efficient, climate friendly, and modern alternative to gas or electric furnaces. A heat pump takes heat energy from one place and moves it to another by compressing and expanding refrigerant. A heat pump extracts heat from the air and transfers this heat to either the inside or outside of your home, depending on the season. A central heat pump distributes heat and cooling through ductwork connected to vents in each room.